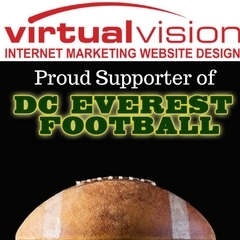 Virtual Vision supported DC Everest Football this week by purchasing a DC Everest Football Discount Card for each of its employees. Business Development Manager, Gary Reissmann's son, Jager Reissmann, is a junior wide receiver this year for DC Everest. You can check out his highlight film from last season by clicking here. DC Everest opens up the season tonight against Appleton North at 7:00 pm at Steim Stadium in Schofield, WI. Virtual Vision is dedicated to community support and involvement, helping the local community through its sponsorship's and support. If your organization is looking for sponsorship, please contact us.